Google announced a new partnership last week with Pandora, the New York Daily News, and several other media companies that could be the death of the paywall model. “Google Consumer Surveys” is a stunningly simple idea. 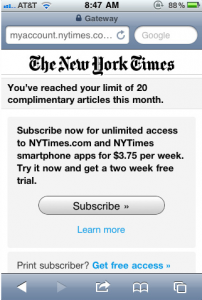 Say you’re surfing the web, and click on a link to a story that would typically be behind a paywall. Rather than pay, you answer a simple marketing question, and as a result are granted access to the article. Google pays the entity five cents for each question answered, which is about $15 per 1,000 pageviews.